The Ace Indoor Putter Practice Set is a complete compact putter set you can use indoors to practice putting. 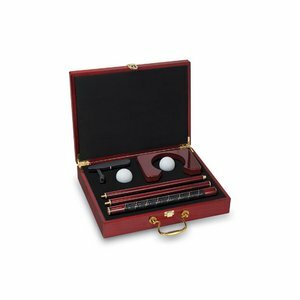 It includes one 4-piece travel putter with a wooden shaft and brass-colored accents, 2 white golf balls, and 1 wooden practice cup in an executive-style wooden traveling case with handle. It's great for business trips, office down time, or practicing your putting technique at home.